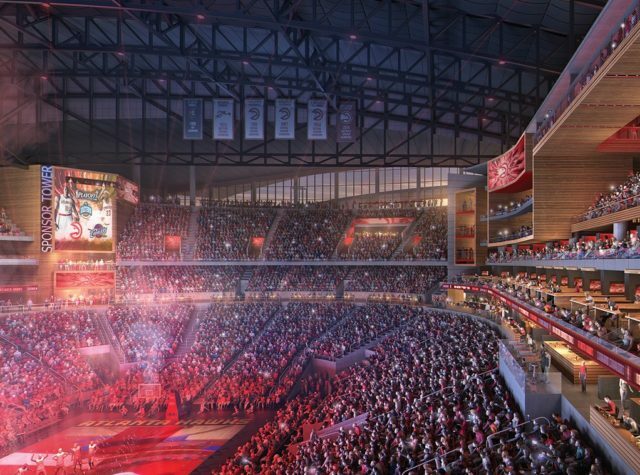 The Atlanta Hawks Basketball Club today unveiled plans to completely transform Philips Arena into a new fan-focused sports and entertainment venue that reflects the ideals and spirit of the City. The transformation will rethink and rebuild the interior of the building from the roof-line to the baseline – and will include major changes to the current arena configuration, including removing the six-level wall of suites on the west side of the arena allowing for new amenities on every level of the building, installing a new state-of-the-art center-hung scoreboard and video displays, and revamping the concourses with 360-degree connectivity and a reimagined eating and drinking experience featuring new open food stalls and bars throughout. The transformation will be the second-largest renovation in NBA history, behind only the recent renovation of Madison Square Garden. 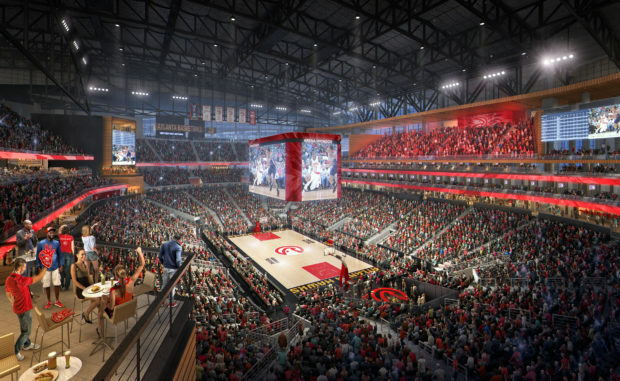 Originally designed as a multi-purpose venue, the demolition and reconstruction of the six-level wall of suites will create a dramatically new seating configuration and enhance the overall viewing experience by creating better sightlines for Hawks basketball and the many A-list concerts and shows that frequent the arena. The number of traditional 20-person suites will be significantly reduced to make way for more modern and flexible suites showcasing a variety of seating options and amenities, tailored to fit any-sized business, entertainment or personal need. Inspired by the success of the Beltline, the arena will also have a tremendous amount of open, connected spaces with unique things to see, experience and enjoy on every level. The new Hawks Bar will be the first bar on the floor in the NBA. Designed in the shape of the Hawks iconic Pacman logo, the bar will be just a handful of feet from the court with one of the best views of the action inside the arena. Each level concourse will have a redesigned look and feel with more open, social dining areas and an increased number of premium food and drink options. The technology throughout the building will also receive a major reboot, centered around the most modern video capability in sports. The new center-hung scoreboard will be over three times the size of the current model and each corner of the reimagined arena will be anchored by state-of-the-art video pavilions. The arena will be the first with 6mm resolution throughout, allowing fans in any seat the best second screen experience in professional sports. Another new addition to the arena will be the Hawks Meeting and Conference Center, an innovative meeting space including a 250-seat master conference room and four additional breakout rooms equipped with the most advanced technology (touch screen technology, interactive whiteboards and top-notch wireless presentation solutions) and access to full top-shelf bars and amenities. 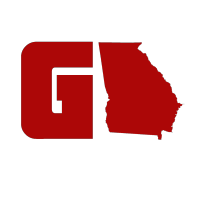 Reflecting the talent and strengths of our city, the Hawks also announced partnerships with True-to-Atlanta trendsetters in media, music and sports entertainment. The franchise will showcase a Zac Brown-inspired restaurant, custom suites experience designed by Topgolf and one of Killer Mike’s signature SWAG Shop barbershops. Each exclusive space will be the first-of-its-kind inside a major arena or stadium. HOK, the largest U.S.-based architecture-engineering firm and second-largest interior design firm, is the leading architect on the project. The firm is also serving as lead architect of the Emory Sports Medicine Complex, the world-class sports medicine center and training center in Brookhaven set to open later this year. 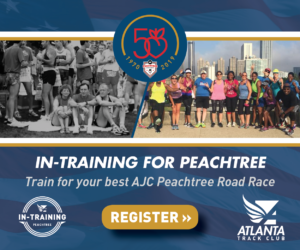 Construction started on June 20th and will be completed during the 2018-2019 season, coinciding with the Hawks’ 50th Anniversary in Atlanta. The Hawks will play all regular season home games at the arena during that period. The $192.5 million reimagination will revitalize the city-owned arena as a basketball-first, world-class sports and entertainment venue that hosts approximately 170 events and nearly two million guests annually. The Hawks committed to an 18-year lease extension to remain in downtown Atlanta through 2046. For more information, renderings and video on the arena transformation, please visit www.hawks.com/arenatransformation.